MicroStrategy is an analytics and mobility platform that enables data-driven innovation. 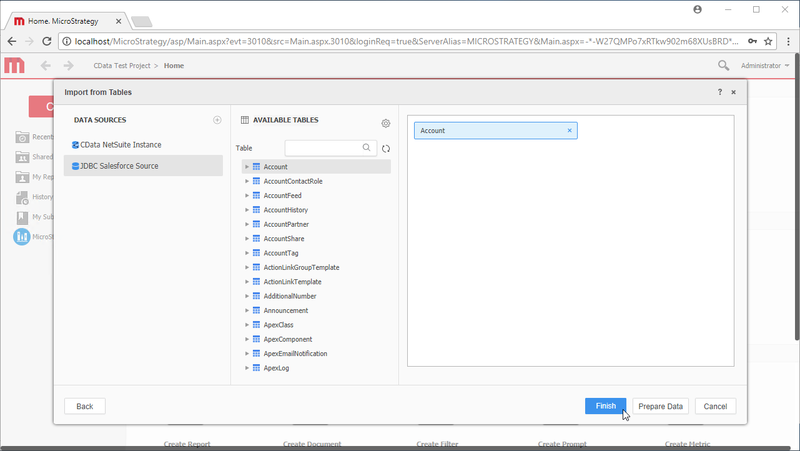 When you pair MicroStrategy with the CData JDBC Driver for Salesforce, you gain database-like access to live Salesforce data from MicroStrategy, expanding your reporting and analytics capabilities. In this article, we walk through adding Salesforce as an external data source in MicroStrategy Web and creating a simple visualization of Salesforce data. 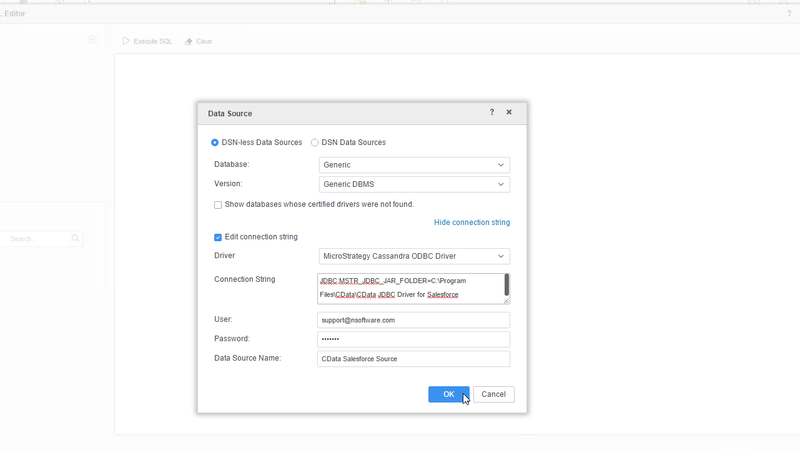 You can connect to Salesforce in MicroStrategy Web by adding a data source based on the CData JDBC Driver for Salesforce. 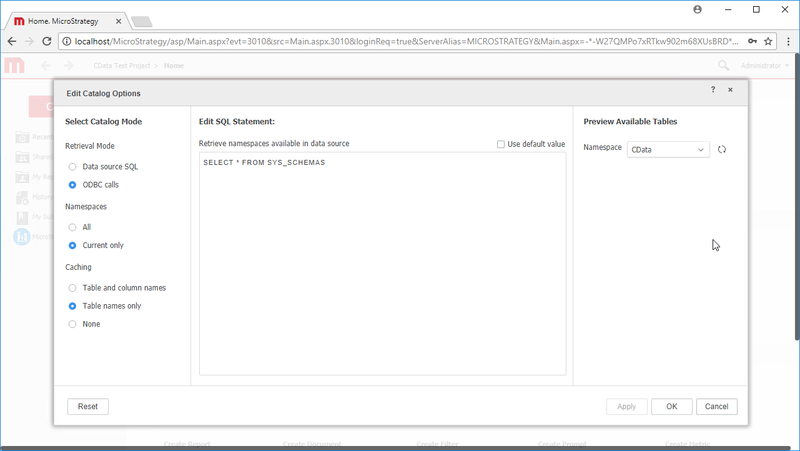 * Before you begin, you will need install the JDBC Driver for Salesforce on the machine hosting the MicroStrategy Intelligence Server that your instance of MicroStrategy Web is connected to. Once you have created a data source you can build dynamic visualizations of Salesforce Data in MicroStrategy Web. Open MicroStrategy Web and select your project. Click Add External Data, select Databases, and use Select Tables as the Import Option. In the Import from Tables wizard, click to add a new Data Source. Select Generic in the Database menu and select Generic DBMS in the Version menu. Click the link to show the connection string and opt to edit the connection string. 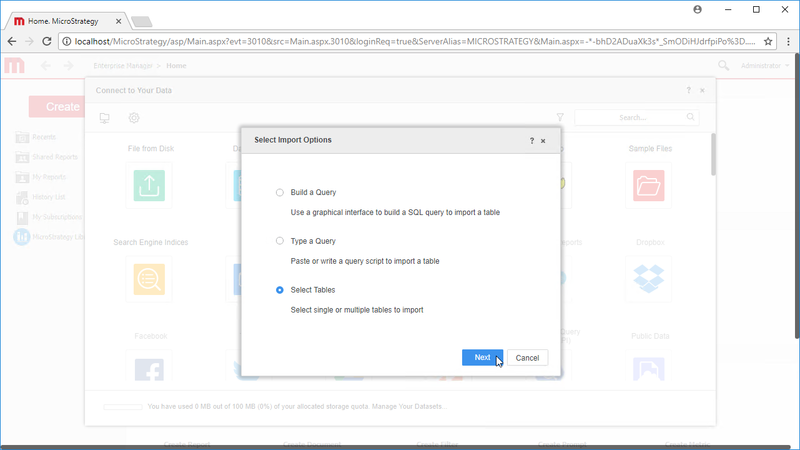 In the Driver menu, select MicroStrategy Cassandra ODBC Driver (MicroStrategy requires a certified driver to interface through JDBC, the actual driver will not be used). Drag tables into the pane to import them. 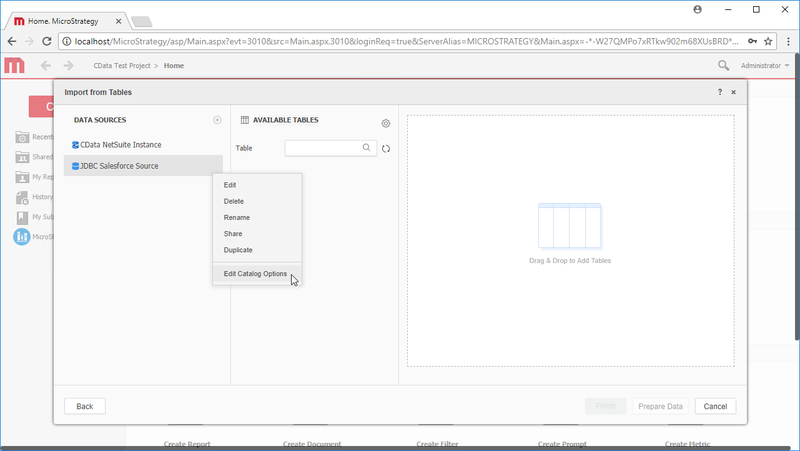 Note: Since we create a live connection, we can import whole tables and utilize the filtering and aggregation features native to the MicroStrategy products to customize our datasets. Click Finish, choose the option to connect live, save the query, and choose the option to create a new dossier. Live connections are possible and effective, thanks to high-performance data processing native to CData JDBC drivers. Once you have finished configuring the dossier, click File -> Save. 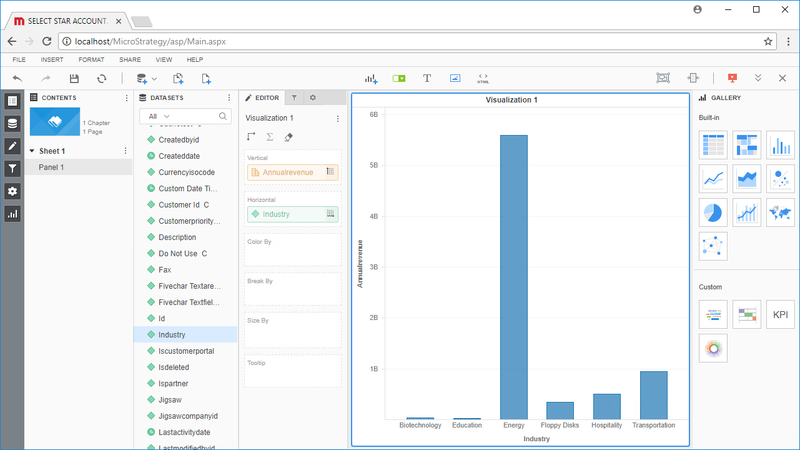 Using the CData JDBC Driver for Salesforce in MicroStrategy Web, you can easily create robust visualizations and reports on Salesforce data. 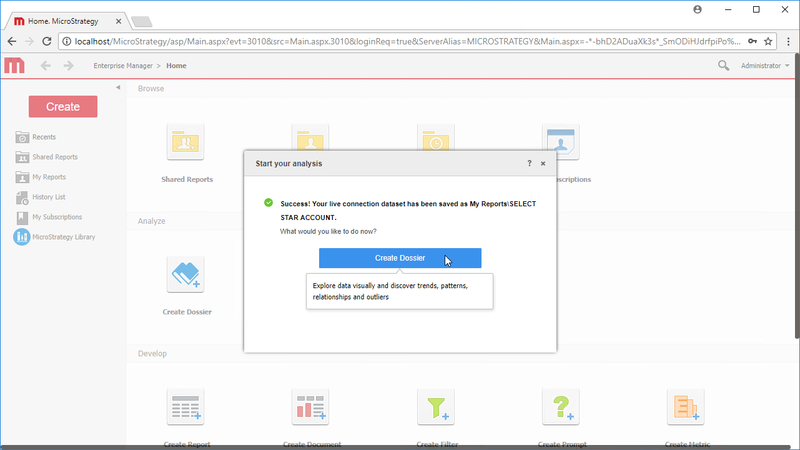 Read our other articles on connecting to Salesforce in MicroStrategy and connecting to Salesforce in MicroStrategy Desktop for more examples.